That’s 125 pounds of food, and it cost me a total of $54. _I don’t intend to actually eat any of this food; instead, it will all go into permanent storage where it will stay until it is needed. This is part of my food insurance program. If that is your opinion, then please perform this simple task for me: Write down what you spend annually on automobile insurance. Add what you pay for health insurance. If you have homeowners or renters insurance, add that to the total. Don’t forget life insurance payments. Include any other insurance premiums you pay. What is the sum total of all the insurances you pay for over the course of a single year? Does $50 for food insurance seem so expensive now? Is food less important than your car, your home, and your health? Would you say to yourself, “I’m certain I’ll never be in an automobile accident; therefore I don’t need car insurance”? Or “I’m sure nothing will ever happen to my health, so I don’t need health insurance”? Wouldn’t that be putting a whole lot of faith in things that are completely beyond your control? Are you absolutely certain that you’ll always have total control over your food supply? I spent $54 on food insurance because I think that it’s possible that the food supply may be interrupted one day. Maybe you think it’s impossible for the food supply to run out. But consider this: What happens if I’m wrong? If I’m wrong, then the worst case scenario is that I’ve just spent $54 on something that will be either thrown out or given away when I die. But what happens if you are wrong? What’s the worst case scenario then? Think of how cranky you get when you miss a single meal. Now, multiply that level of crankiness by the number of people in your household; on your block; in your city. How many times in your life have you gone an entire day without eating? Given the food you have on hand right now, how long could you last without going hungry? After that food was gone, how long could you continue to function without food? If you’re hungry, how long would you say is an acceptable amount of time to wait for the National Guard to show up? What if you have dietary restrictions? Are you really willing to put your mental, physical, and emotional well-being in the hands of perfect strangers who may or may not perform up to your expectations? 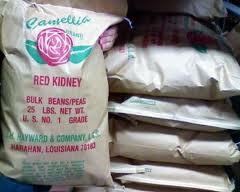 A 25-pound sack of salt costs less than a latte at Starbucks. 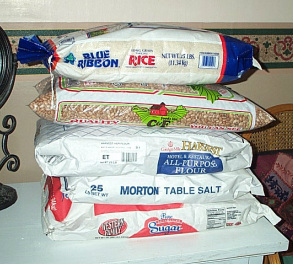 A 25-pound bag of rice or flour costs about as much as a pack of cigarettes. That sack of sugar runs about the same as a used video game, and the bag of beans costs less than a single meal at Perkins or Olive Garden. Together they collectively cost less than a tank of gas for your car, or about the same as a hair-do at the salon. Buying 125 pounds of food for $54 works out to about 43 cents for a pound of food. 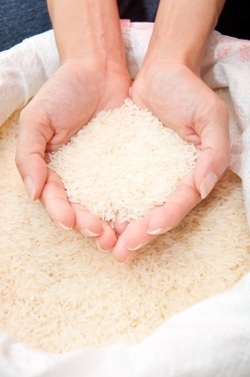 Rice runs about 3 cents a serving and beans pencil out at 7 cents a serving, so you can have a plate full of rice and beans for a dime. What else can you buy for ten cents that might be that valuable one day? Fifty dollars worth of food is buying you fifty dollars worth of future. How much is your future worth? Never before has food been cheaper, more varied, better preserved, or more readily available. In fact, the top health problems of Americans are caused by too much food. There has never been a more opportune time to stock up. Food rarely goes down in price. Even if you never starve, food insurance will at least offer protection from price gouging. Have you ever seen grocery stores drop prices right before a hurricane? Still skeptical? Then perform one more simple exercise for me: Add up what you typically spend on groceries for you and your household in any given month. Include what you spend on meals out. If you take the kids out for a pizza, you’ll probably top $50 on a single meal. Given the state of your kitchen at this very instant, if you were unable to enter a grocery store or purchase any kind of food for seven days, could you keep your family fed? What if all the stores were closed for a month? If you wear a seat belt, get medical check-ups, own a fire extinguisher, and pay your insurance premiums, then you’re working to protect your future. If the quality of your life tomorrow is as important as the quality of your life today, then why not invest a tiny bit of your today preparing for tomorrow? What are you waiting for? No matter what kind of event occurs— hurricane, tornado, earthquake, peak oil, economic collapse, pandemic, zombie apocalypse, asteroid, alien attack, and/or the second coming of Christ—the first thing that happens is that the food supply is interrupted. Are you willing to bet $50 that nothing will ever happen?